In case of zombie apocalypse, you’ll want EK Archery’s Cobra RX Adder. It’s the world’s first commercially available Tactical Repeating Crossbow, and is great for hunting, recreation, or fighting the undead. It boasts Picatinny rails, a red dot sight, fore-grip, quick detachable sling shoulder mount, an AR-15-inspired adjustable stock, and a top-load magazine capable that holds 5 EK carbon bolts. Read more for a testing video and additional information. Ivan Santic and HARDWAR3 Industries’ DX-12 Punisher double-barreled shotgun looks to be straight from a video game., complete with compact 12 gauge slugs. One caveat: the short, pistol-style barrel firing those 12-gauge shells would have some gnarly recoil not found in your latest first person shooter game. Continue reading for more pictures and information. 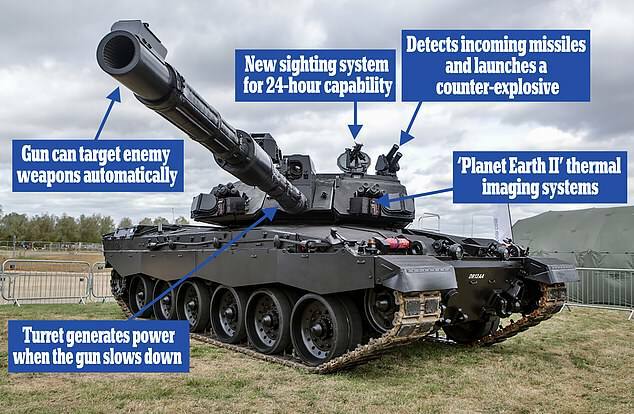 BAE Systems has unveiled an upgraded Challenger 2 tank, called “Black Knight,” that now includes an ‘active protection system’ which allows it to detect incoming anti-tank missiles or armor penetrating rounds. This system can also automatically launch a counter-explosive to neutralize the threat. Other features include: front / rear infrared cameras and two independent night vision systems to enable a gunner to focus on one target while a commander identifies others simultaneously. Continue reading for another video and more information. Forward Defense Munitions’ L5 Caseless Ammo Rifle, also known as the “ribbon gun”, is capable of firing four bullets at once. How? It boasts four 6 mm barrels cut side by side within one steel block, but it uses special bullets, as they are encapsulated in ‘blocks’ so each round is aligned with a barrel, which are made in a single piece of metal. Continue reading for another video, more pictures and information. There have been some drone incidents that nearly caused major accidents with aircraft, but IXI Technology’s Dronekiller could change that. This jamming gun has a range of up to 800 meters, and is good for 4-hours of continuous use when fully charged, thanks to hot-swappable battery packs. When depleted, simply connect it to any 12-volt vehicle outlet. Continue reading for a hands-on video and more information. The THeMIS (Tracked Hybrid Modular Infantry System) is a multi-mission, unmanned ground vehicle (UGV), developed by Estonia-based defence and security services provider Milrem, could be the ultimate war weapon. It’s designed for a range of military missions in dangerous or hard-to-reach areas, as THeMIS can be configured for different roles including reconnaissance, observation, target acquisition, communications relay, logistics support platform, rescue, fire-fighting, and medical evacuation (medevac). Continue reading for another video and more information.